Welcome to The Old Grain Store at Tarnock Farm in Somerset. The cottage is a comfortable and well furnished 2 bedroomed property, believed to date from around 1650, and converted in 2005 by the present owners. It is located adjacent to the owners farmhouse at Tarnock Farm in Somerset, close to the A38 and approximately 5 minutes from the M5, junction 22. 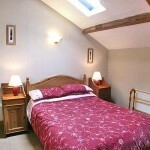 The cottage sleeps up to 6 people in the 2 double bedrooms + double sofa bed on the upstairs gallery area. The cottage is superbly located for touring and provides a well furnished and equipped and most comfortable holiday base. Within easy reach are Cheddar, with its magnificent gorge and caves, Wells cathedral, Glastonbury Tor, the sandy beaches at Weston Super Mare and the beautiful Georgian city of Bath. Excellent walking on Mendip Hills, bird watching on Somerset Levels, golf and fishing. 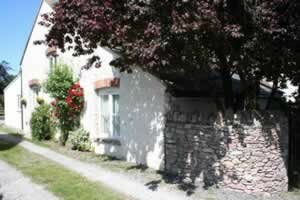 On the ground floor the cottage comprises a sitting/dining room and kitchen, 2 double bedrooms, shower room with toilet. 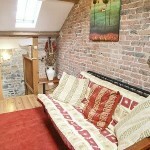 Upstairs there is a delightfully bright galleried area with double sofa bed (for children). 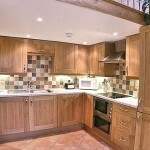 In the kitchen there is an Electric cooker, Fridge freezer, Microwave, Washer / Dryer and Dishwasher. All rooms with the exception of the gallery area are on the ground floor and suitable for guests with limited mobility. Outside there is a small garden with patio area and furniture. Fuel (electric), linen and towels are all included. Free Wifi. There is parking for 1 or 2 cars. 1 dog is welcome for a small additional charge. 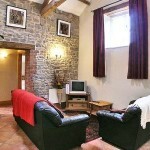 The Old Grain Store was rated 4* by Cottages4you and awarded a Gold Award in 2010.